Sponsoring ApacheCon is a great way to get your name in front of the most important software producing organization on the planet, the Apache Software Foundation. There's lots of different ways to sponsor ApacheCon. ApacheCon has been held most years since 1998 - even before the Apache Software Foundation was incorporated! Wherever possible we have kept archives of the conference sites, and links to slides and videos where available. Hopefully these will provide some useful education and history about a variety of Apache projects. US Roadshow DC, 2019 was held in Washington DC, USA. 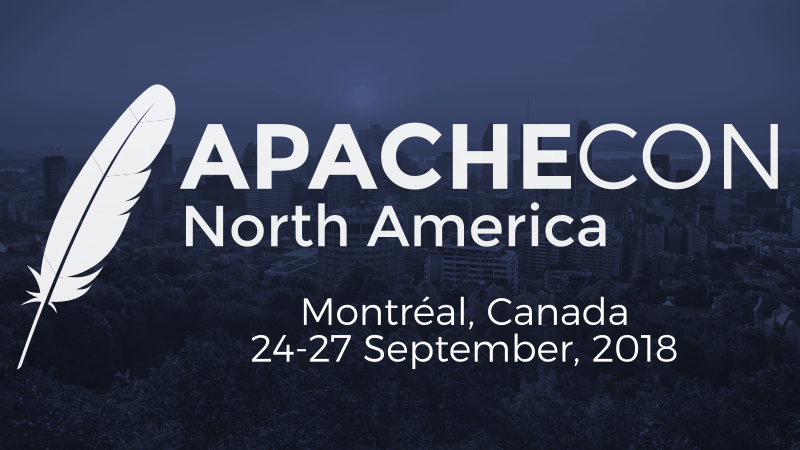 ApacheCon NA 2018 was held in Montrêal, Canada. Apache BigData NA 2017 was held in Miami, FL. ApacheCon NA 2017 was held in Miami, FL. Apache BigData EU 2016 was held in Seville, Spain. ApacheCon EU 2016 was held in Seville, Spain. Apache BigData NA 2016 was held in Vancouver, BC. ApacheCon NA 2016 was held in Vancouver, BC. Apache BigData EU 2015 was held in Budapest, Hungary. ApacheCon EU 2015 was held in Budapest, Hungary. ApacheCon NA 2015 was held in Austin, TX. ApacheCon EU 2014 was held in Budapest, Hungary. ApacheCon NA 2014 was held in Denver, CO.
ApacheCon NA 2013 was held in Portland, OR. ApacheCon EU 2012 was held in Sinsheim, Germany. ApacheCon NA 2011 was held in Vancouver, BC. ApacheCon NA 2010 was held in Atlanta, GA.
ApacheCon US 2009 was held in Oakland, CA. ApacheCon EU 2009 was held in Amsterdam, Netherlands. ApacheCon US 2008 was held in New Orleans, LA. ApacheCon EU 2008 was held in Amsterdam, Netherlands. ApacheCon US 2007 was held in Atlanta, GA.
ApacheCon EU 2007 was held in Amsterdam, Netherlands. ApacheCon US 2006 was held in Austin, TX. ApacheCon Asia 2006 was held in Colombo, Sri Lanka. ApacheCon EU 2006 was held in Dublin, Ireland. ApacheCon US 2005 was held in San Diego, CA. ApacheCon EU 2005 was held in Stuttgart, Germany. ApacheCon US 2004 was held in Las Vegas, NV. ApacheCon US 2003 was held in Las Vegas, NV. ApacheCon US 2002 was held in Las Vegas, NV. ApacheCon US 2001 was held in Santa Clara, CA. ApacheCon EU 2000 was held in London, England. ApacheCon US 2000 was held in Orlando, FL. ApacheCon 1998 was held in San Francisco, CA. The content for this website and for ApacheCon is provided by volunteers - usually, the same developers building Apache projects. So our apologies if we've missed something! You can contact us at apachecon-discuss@apache.org if you spot an error. Copyright 2017, The Apache Software Foundation, Licensed under the Apache License, Version 2.0.